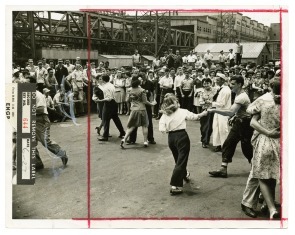 Dancing at lunch time is a new recreation activity for war workers at Cramp's Shipyard. When the opening dance was held this week about 60 couples stepped about the roped-off concrete floor to the music of the company band. Dances will be held at least twice weekly.